English merchant; died in London in 1818. He was connected with the West India trade, and in this connection entered into relations with Napoleon after the Treaty of Amiens, arranging for the shipment of goods to the value of £260,000 to the French West Indies for the use of the troops commanded by General Leclerc. The latter drew a draft on Paris for the amount, but this was dishonored on a frivolous pretext, and Lindo does not appear to have ever obtained his money. 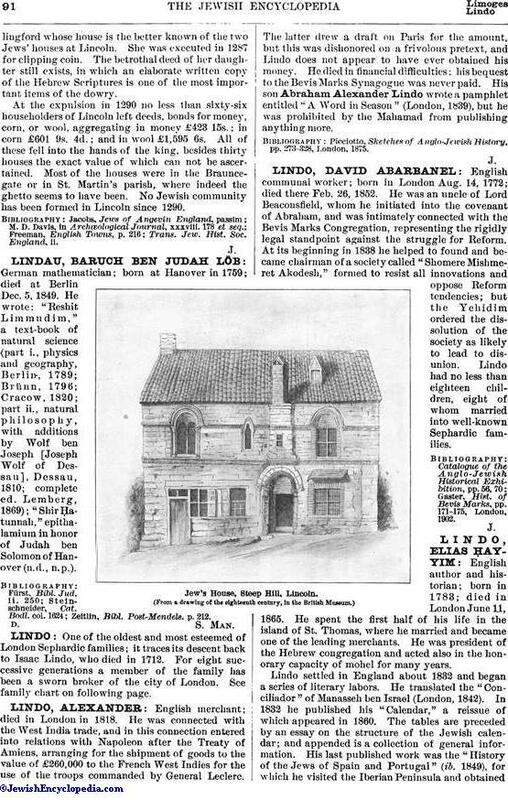 He died in financial difficulties; his bequest to the Bevis Marks Synagogue was never paid. His son Abraham Alexander Lindo wrote a pamphlet entitled "A Word in Season" (London, 1839), but he was prohibited by the Mahamad from publishing anything more. Picciotto, Sketches of Anglo-Jewish History, pp. 273-328, London, 1875.